The 25th International Fibrinogen Workshop will be held at the Graylyn International Conference Center of Wake Forest University in Winston-Salem (USA) from June 3rd to June 7th, 2018. For the first time, it will be held jointly with the 3rd International Factor XIII Workshop. The latest advances in basic, clinical and bioengineering research relating to Fibrinogen and Factor XIII will be presented by international leaders in these fields. This biannual conference is an excellent opportunity to exchange ideas, learn about recent progress and become inspired. 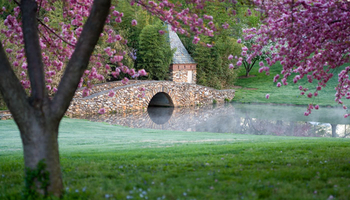 Graylyn, a beautiful historic estate situated on 55 acres of park land close to Wake Forest University, is considered to be one of the finest conference centers in America. It blends old world charm, innovative technology and personal touch, providing an ideal setting for focused learning, close interactions, and also relaxation. We hope to have the pleasure to welcome you in Winston-Salem. Protein images in the header, courtesy of Artem Zhmurov & Valeri Barsegov (Fibrinogen) and Istvan Komaromi & Zsuzsa Bagoly (Factor XIII). June 3rd to June 7th, 2018.